A dish detergent which biodegrades easily and quickly while minimizing negative effects on the environment? Here it goes! 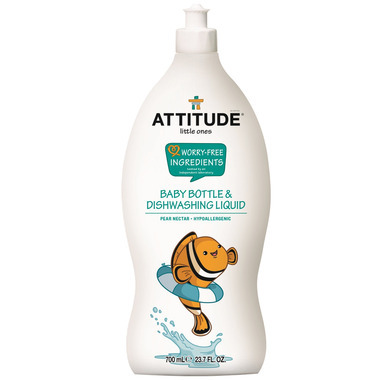 Designed for everyday use, ATTITUDE Little Ones Dishwashing Liquid can safely be used and targets milk and residues from baby bottles, sippy cups, pacifiers, and breast pump components. I love the scent of this dish soap. It does not form a bunch of suds and did not do a great job getting milk residue out of bottles. I love this brand. I bought this for my child and for baby shower gift. Good price. Great soap however runs out fast. Doesn't foam like other traditional soaps so it's taking a bit getting used to. Love this product. Smells lovely and is nice and mild for cleaning baby's bottles. Purchased this over and over! Works well. Smells good. Rates well on the ewg website (environmental working group), which gives me piece of mind. Purchased for a friend who just had a baby and she was soooo excited to receive a natural safe product which smells great! Great product. Great value. Smells so good!